The weather’s getting cooler, leaves are changing colors, and the sun goes down just a little bit earlier. As we approach the first day of Fall (mark your calendars for September 22nd! ), our minds are shifting gear away from summer and into a new season of football*, food, and pre-holiday excitement. 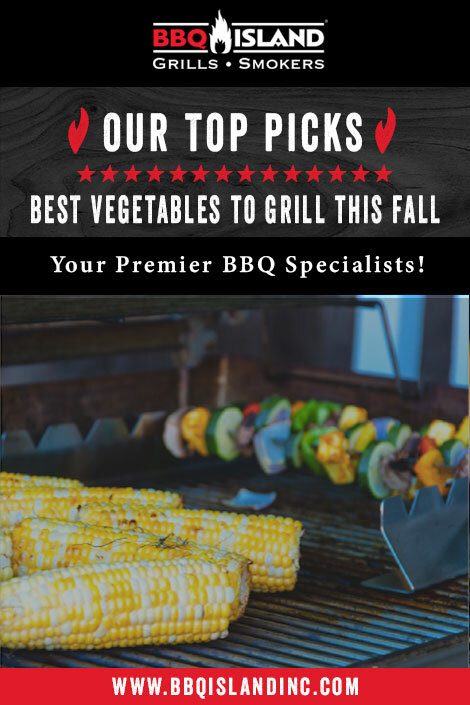 You may be thinking that barbecue season is long gone, but the truth is there is never a bad time of year to fire up your BBQ Island grill. The best move you can make is to give your vegetables the same love you give your meat! Season and prepare your food to taste about 30 minutes before tossing them on the grill. We love our Jacobsen Salt Co. salts, which are perfect for veggies and meat alike. Oil the grill! If you oil the veggies before you throw them on the grill, you run the risk that they will burn too quickly, leaving a not-so-great taste. Get your grill hot and use a clean towel to oil your grill grates. Skewers are your friend! A fun and easy way to grill your smaller vegetables is to stack them on skewers. They’re easy to both cook and eat, and perfect for parties as they’re an easy grab-and-go meal. If skewers aren’t your thing, use a grill basket to make sure vegetables like brussel sprouts, tomatoes, or mushrooms don’t fall through the grates. Cut wisely! The size of each vegetable can make or break how they will look and taste. Smaller vegetables will overcook easily, leaving you with a soggy and burnt-tasting zucchini slice (and no one wants that). When you can, leave your veggies slightly thicker than you normally would to avoid the grill’s wrath! As far as what grill is best suited for your greens, anything goes whether you’re a gas or charcoal fan. We love grilling vegetables on a Kamado-style grill like the Big Green Egg. Kamado grills absorb and radiate heat from the charcoal directly back to your food, leaving veggies as tasty and tender as ever. Who knew that getting your fair share of nutrients was as easy as heating up your favorite grill?! For all the tools and accessories you need, shop https://www.bbqislandinc.com/ or visit us at one of our three locations in Arizona!